This chapter briefly introduces scholarly debates in the field of nationalism, on the one hand, still split between modernists and their critics, and on the other, divided over the nature, typology and history of the nation and nationalism. 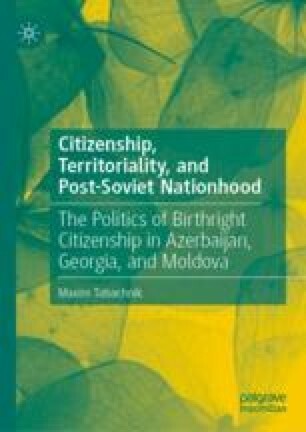 It also proposes to distinguish between “civic” and “territorial nationalisms” in its own theoretical approach to the ethnic/civic dichotomy, taking into the account critiques of civic nationalism, in order to apply the dichotomy to the research puzzle. Bereketeab, Redie. 2012. The Ethnic and Civic Basis of Citizenship in the Horn of Africa. In Predicaments in the Horn of Africa: 10 Years of SIRC Conferences in Lund on the Horn of Africa. Ulf Johansson Dahre, ed. Pp. 313–330. Lund, Sweden: Lund University. https://globalarkivet.se/5569, accessed December 14, 2016. Calhoun, Craig. 2005. Nationalism. In Encyclopedia of Social Theory. George Ritzer, ed. Thousand Oaks, CA: Sage. http://sk.sagepub.com/reference/socialtheory/n201.xml, accessed September 9, 2016. Gasca, Viorelia. 2012. Country Report: Moldova. Florence, Italy: EUDO Citizenship Observatory. http://eudo-citizenship.eu/admin/?p=file&appl=countryProfiles&f=Moldova.pdf. Larin, Stephen J. 2010. Conceptual Debates in Ethnicity, Nationalism, and Migration. In The International Studies Encyclopedia. Robert Denemark, ed. Pp. 438–457. Rochester, NY: Wiley-Blackwell. https://papers.ssrn.com/abstract=1934606, accessed December 5, 2016. Marx, Karl. 1848. Manifesto of the Communist Party. https://www.marxists.org/archive/marx/works/1848/communist-manifesto/, accessed April 3, 2016. Saakashvili Gives Citizenship to 3000 Georgians in Turkey. 2013. Democracy and Freedom Watch. http://dfwatch.net/saakashvili-gives-citizenship-to-3000-georgians-in-turkey-92797-23323, accessed August 1, 2015. Statistical Data on Latvian Population by Citizenship Status. 2016. Latvian Department of Citizenship and Migration. http://www.pmlp.gov.lv/lv/assets/documents/statistika/IRD2016/ISVP_Latvija_pec_VPD.pdf, accessed June 7, 2016. Vink, Maarten P., and Gerard-René DeGroot. 2010. Birthright Citizenship: Trends and Regulations in Europe. SSRN Scholarly Paper, ID 1714975. Rochester, NY: Social Science Research Network. http://papers.ssrn.com/abstract=1714975, accessed April 19, 2014.